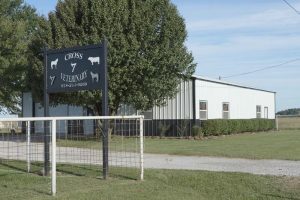 service mixed veterinary practice located in Northeast Oklahoma offering high quality veterinary services. We strive to provide honest and exceptional care for your animals. Our open exam area creates a relaxed and friendly atmosphere which includes you in all aspects of your animals care. Dr. Liz (Elizabeth Fullbright, DVM) and our staff will provide quality health care for your animals, treating each patient as they would their own animal. Dr. Liz proudly treats large and small animals. Click here to view our brochures for more information. We make every effort to keep our fees fair and reasonable. We will be happy to discuss our fees with you before we perform any services, and give you an estimate prior to treatment. Payment is expected at the completion of services. Cash, checks with ID, Visa, MasterCard, Discover and debit cards accepted. If you have an emergency, we can be reached at 918-244-0269 during office hours, and after office hours at 918-244-6708. We realize that finding time in a busy schedule for pet care can be difficult. Therefore, we offer the convenience of pet drop-offs as early as 8:00 am the morning of services, or even the night before. Contact us to find out how you can take advantage of this service.